 Spains indignados made the move from city squares to the halls of power on Sunday in municipal and regional elections that saw an anti-poverty activist elected as mayor of Barcelona and the ruling Peoples Party (PP) battered at the ballot box, reports the Guardian. 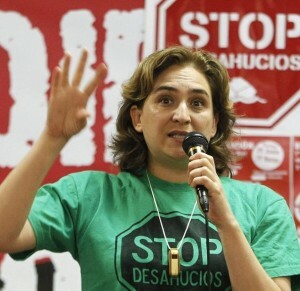 The biggest victory of the night was for Ada Colau, an anti-eviction activist and leader of Barcelona en Comú (Barcelona in Common), who was elected mayor of Barcelona. Barcelona en Comú is a grassroots coalition of several parties and thousands of activists. It includes Podemos, the new radical left party, which was founded just over a year ago and won 5 MEPs in last years European elections. Barcelona en Comú was crowdfunded and underpinned by a strong code of ethics, written by its members. It plans to limit the mayoral monthly salary to 2,200 (£1,600) and eliminate official cars and expense budgets for attending meetings. Elsewhere, the elections were a disaster for the ruling PP, which previously controlled a majority of Spains regional parliaments  now they run none of the newly elected ones. Nor are they certain to run Madrid, where their candidate, a countess, won most votes and 21 seats on the city council. But Podemos came from nowhere to take twenty and the PSOE came third, so a left-wing alliance looks possible. Posted in: Europe, International, Outside Left, Politics. Let’s hope London will have a ‘London in Common’ mayoral candidate. We do have a possibility with Christian Wolmar who has a track record on working with the homeless. Unfortunately we’ll end up with someone like Dianne Abbot. Seems like a decent bloke with good ideas but he will be hamstrung by his association with the Labour Party. And anyway, Labour will most likely will select a Blairite. Talented and experienced candidates like Wolmar should break with the Labour Party instead of wasting their energy banging their heads against a brick wall. Rod, we are talking about selecting a Labour candidate. How is Wolmar hamstrung by being associated with the Labour Party? Well, I’m talking about the content of the above article titled “In Spain, election results are good news” and I’m hoping to see more good news election results in the UK. The pro-austerity, pro-Trident, pro-military intervention Labour Party has just lost a general election in the UK. The anti-austerity, anti-Trident, anti-military intervention SNP achieved a startlingly good result. Well no, it’s not enough said. My point is that, if we take what you say, then all Labour candidates are tainted and in case you haven’t noticed the pro Trident Pro austerity pro military intervention Tories have just won an election. The thing about the Tories is that they weren’t offering an alternative to the Tories. They actually were the Tories. Now, if you want an alternative to a Tory government you’ll probably want to vote for it. Labour failed to provide an alternative and instead offered unconvincing, incoherent nonsense. And the Labour Party was rewarded appropriately. Well done John P Reid. You spelled it incorrectly and is it relevant? The T shirt says ” Stop Evictions”. This is a big issue in Spain and I believe that the government and the banks have done that. All it was doing was throwing more properties onto an already fllooded market driving down prices. I thought it was where u live? Ian Dury and The Blockheads. What do you mean you’ve never heard of them?